Daiso has caused me to spend a lot of money. This time round, it's yet another nail item. 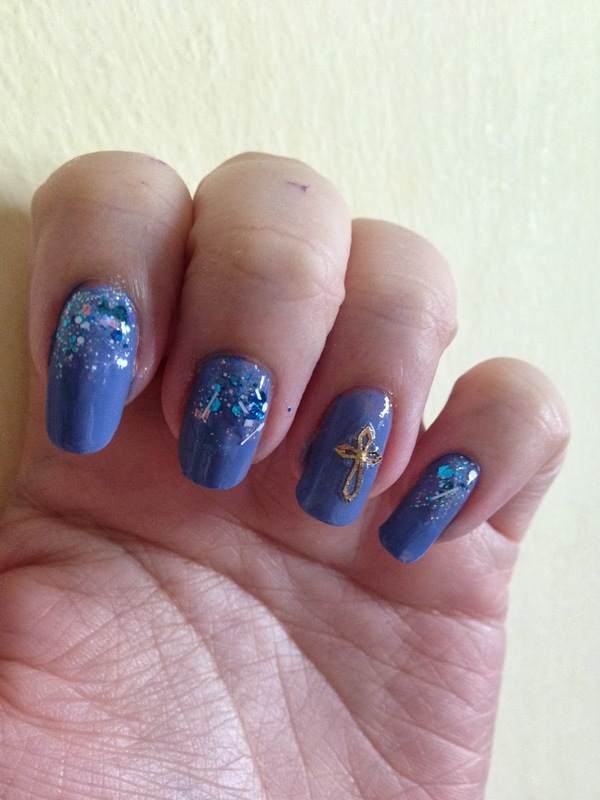 I spotted the gold nail stickers of crosses and Fleur de lis. Only S$2...couldn't resist. So, I didn't want any gothic nails so I decided to go with something rather simple. I used a heck of a lot of glitter and it's quite visibly thicker than the rest of the base nail polish. I used China Glaze's blue-purple, a cheap large blue glitter, Innisfree White holographic nail polish as well as another silver glitter. I think the most expensive polish used here is the China Glaze polish which I bought on sale for only S$9. What do you think? Quite different from all the recent flower designs huh? Well, I might just do another flower design next week thanks to a video tutorial by @cutepolish. I think she and @ellelandish were tasked to do a video using Sephora's FX Spring line AND that they had to do a design with toothpicks and had to have flowers. Both were scarily similar in the sense of items used. I've watched enough of both girls' videos to also know that they would've used dotting tools or mentioned alternative tools but in those particular videos, none were mentioned. Ok...enough of me ranting on about 2 videos and 2 designs that you've obviously not watched. Till next week then!